Betty Olson is a 4th generation rancher in Harding and Perkins Counties. She and her husband Reuben have been married for 54 years and have six children, 17 grandchildren and 4 great grandchildren. They live on the ranch that was founded by Reuben's grandfather in 1898 and their east place was founded by Betty's great grandparents and includes the old post office and ranch store of Glendo that was founded by her great grandparents. 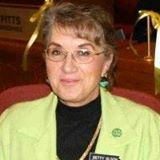 Betty served ten years in the South Dakota legislature from District 28, is president of the Harding County Historical Society, and is a current member and past president of the Women's Missionary Federation at Slim Buttes Lutheran Church at Reva, SD. Betty has been an EMT with the Harding county ambulance service for almost 35 years. She was a Harding County Bookmobile board member and is a substitute teacher in the Harding County schools. She is currently President of the Great Western Cattle Trail Association and was the former president of the High Plains Western Heritage Center in Spearfish. Betty writes a weekly column, the "Grand River roundup", in several newspapers in North and South Dakota and was a member and junior leader of the Thunder Butte 4H Club in Perkins County.